The August 25, 2012, Big Bear Classic Boat Show had a beautifully restored 26‘ Chris Craft named “Step In Again 1”. Sixty years ago, this boat was a familiar site on Big Bear Lake. It was part of a fleet of four “Step In Again” high performance tour boats that operated on the lake from the late 1930’s through the early 1950’s. “Step In Again One” was the most powerful, and fastest boat in this small fleet. What made it so unique, was that it was powered by a huge 500 hp Allison aircraft engine. It was removed from Big Bear in the late 1940’s, when it’s engine blew up on a high speed run down the lake. Now after more than sixty years later, “Step In Again 1” is back on Big Bear Lake. Click Here for more photos and the full story. 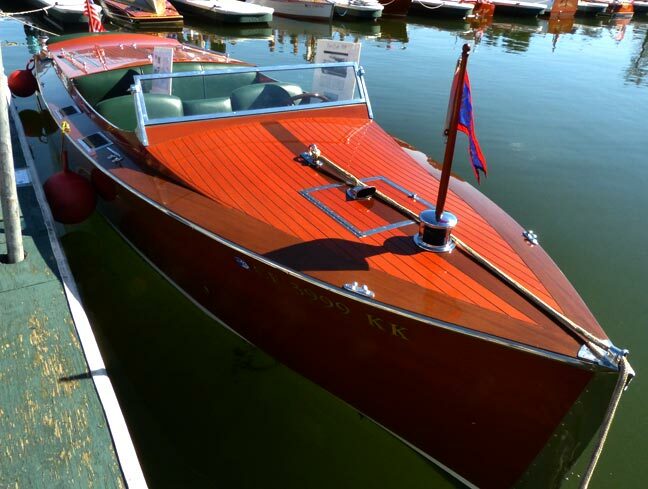 A beautifully restored "Step In Again 1" at the 2012 Big Bear Lake Classic Boat Show. © 2012.